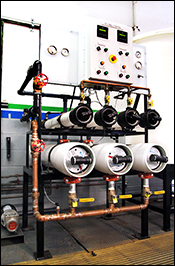 Reverse Osmosis is a water filtration process where dissolved solids are removed from water using a thin film membrane to effectively filter out the dissolved solids and salts. This thin membrane combined with water pressure allows only water to pass through the material and the dissolved solids in the membrane. These membranes are the most important part of the RO system and are commonly spiral wound made of either: CTA, Cellulose Tri-acetate, which is chlorine tolerant, or TFC/TFM, a thin film composite material which is not chlorine tolerant. Over time, these membranes will collect enough to slow down the ability to pass water thus reducing efficiency. This water flow may be a critical part of a water system or part of a manufacturing process, and reduced flow due to blockage will result in low water pressure or loss of production. All Water Systems provides reverse osmosis membrane cleaning to restore the membranes to a more efficient level of filtration. 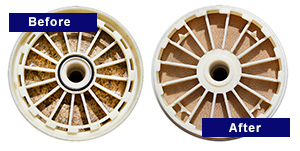 We offer a unique process that additionally provides a before and after analysis of the membrane to illustrate what percentage of filtration flow has been restored and how many more times the filter may be cleaned before requiring replacements. This information provides you with better monitoring of your RO system and helps you to budget for replacement membranes in advance. This benefits you by helping you estimate replacement membranes for the future and reduce downtime repair costs. For more information about our reverse osmosis membrane cleaning service, call us at (412) 824-6560, or click here to contact us.